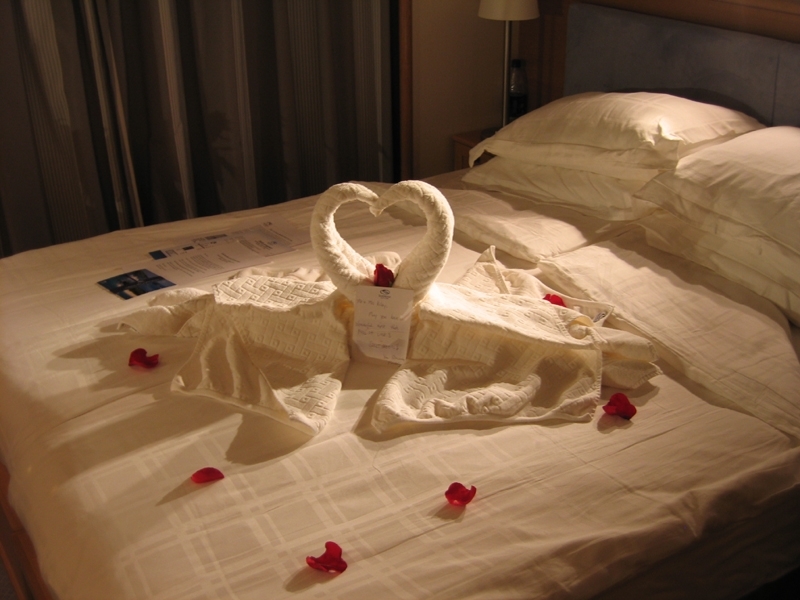 A Yachting Honeymoon in the Mediterranean- You’re SeaDreaming! Posted on July 12, 2017 at 6:36 pm. SeaDreaming the Mediterranean aboard one of the yachts of SeaDream Yacht Club, vessels that while called yachts are in fact mega motor-cruisers with just 56 staterooms for a maximum 112 guests looked after by a super-attentive 95 crew. And so pampered are these guests, that every year the SeaDream I & SeaDream II twins are voted by rating agencies and in cruise ship passenger surveys; world’s best boutique vessels for dining, service, and value. And best of all, you won’t have to worry about that bane of the cruise-goer; additional onboard costs in bars and “alternative” restaurants that can just seem to add up and up. Because once aboard SeaDream I & SeaDream II, you can virtually put away the wallet or purse: included in your fare is all 5-star dining, wines with lunch and dinner, premium-label drinks from the open bars, nightly pre-dinner cocktail gatherings, use of a 30-course golf simulator and a state of the art fitness center… even crew gratuities. 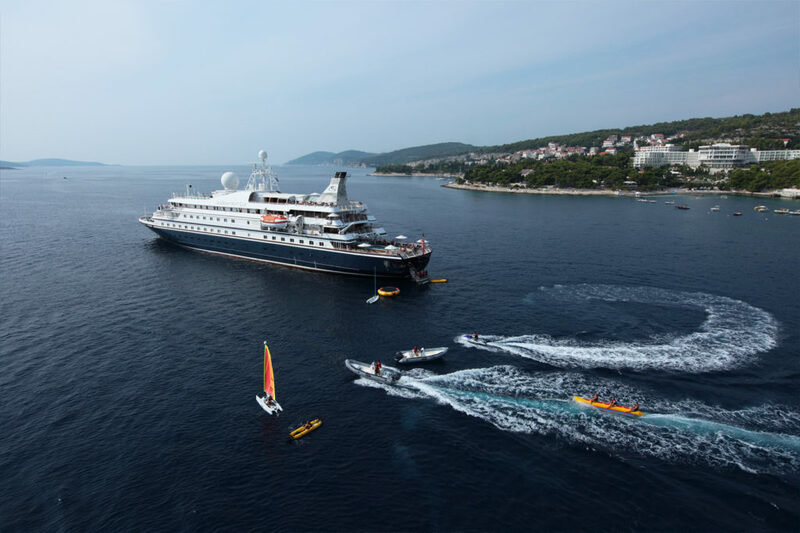 They’ve also a whole range of complimentary power and sail watercraft, from jet skis to laser sailboats, catamarans, kayaks, stand-up paddle boards, water skis, wake boards, a banana boat and others that can be used where local authorities permit. Plus, if you are looking to a bit of exercise while enjoying local attractions in ports of call, complimentary mountain bikes for excursions ashore, as well as daily complimentary Tai Chi and Yoga sessions, or more quietly a library with over 1,000 books and magazines. 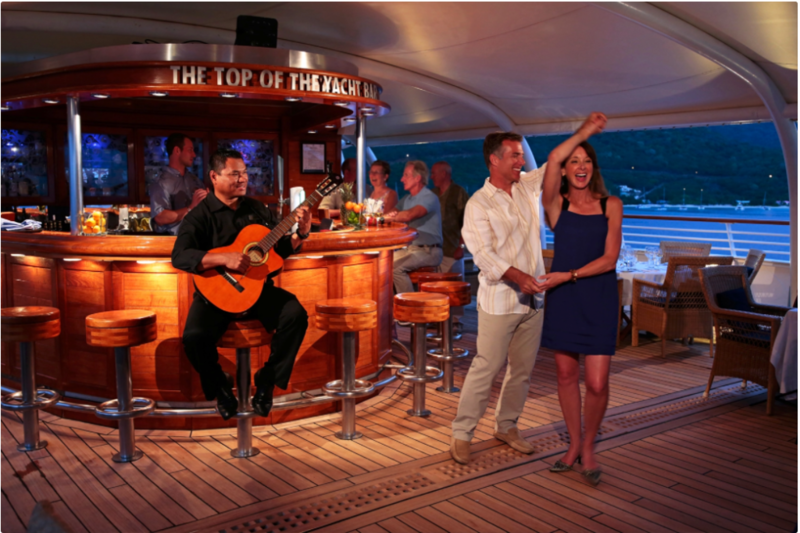 But if all this sounds like enough to be your kind of honeymoon, there’s one more thing that guests (an amazing 40% of SeaDream passengers are repeat guests) constantly cite as their greatest pleasure, and that is the crew. From the moment you board, being greeted at the top of the gangway by the Captain and one of his Officers, a steward with Champagne and others with canapés as you wait the just-few minutes to register and be escorted to your stateroom by your room stewardess, seemingly every crew member knows and remembers your name, and at the bars and while dining, your personal little favorites too. Dining rates amongst the most-memorable of SeaDream’s experiences, with breakfast and lunch on deck, under shade cloths (weather permitting,) and dinners held in the Dining Salon but some on deck too. Though dinner is silver service, there is no call for ties, jackets or ball gowns: for men slacks and collared business or sports shirt (not golf) suffice, and for the ladies cocktail dresses, pant suits, slacks, blouses and the like. SeaDream I & II each have an after-dinner piano bar and gaming table, movies on deck or in the main salon, and dancing to the music of a guitarist at the open-air Top of the Yacht Bar. They do not encourage children under thirteen years of age, and advise families with teens that there are no children-specific facilities aboard, with the result few young families holiday on the yachts. Optional shore excursions are available in ports of call and costs for these can be added to your stateroom account, and on most sailings Chef does at least one shore-side shopping trip, with guests invited to join-in and enjoy complimentary tastings from a range of local stores and markets Chef purchases from for dinner that night. One of the most popular of these is in St Tropez on the Mediterranean coast of France, where as Chef buys fruit, vegetables, local specialty cheeses and other goods, local providores offer tastings of their Rosé wines, cheeses, breads and even a traditional St Tropez onion tart. SeaDream’s annual Mediterranean season from May to October covers myriad ports both large and small along Italy’s Riviera, the Amalfi Coast, Costa Smeralda, the French Riviera, Monaco, Spain’s Balearic Islands, the Croatian Coast, the Aegean and Ionian Greek Islands and Turkey’s Turquoise Coast, making for honeymoon opportunities that will become ever-treasured memories.